New Zealand scientists are breeding a herd of cows that produce lower-fat milk after the chance discovery of a natural gene mutation in one animal. Milk from the cows is also high in health-boosting omega-3 fatty acids and makes butter that spreads as easily as margarine even when chilled, biotechnology company Vialactia said Monday. 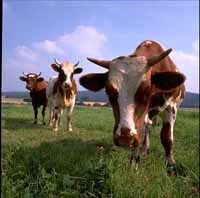 Scientists discovered a cow, later named Marge by researchers, carrying the mutant gene in a dairy herd they were testing in 2001, Vialactia chief scientist Russell Snell said. Vialactia, a subsidiary of the Fonterra Cooperative Group, one of the world's largest milk companies, bought the cow for 300 New Zealand dollars (US$218; euro162) and moved it to a research site. While she looked like any other Friesian cow, testing revealed that Marge's milk contained about 1 percent fat, compared with about 3.5 percent for whole milk. Scientists have yet to isolate the exact chemical pathway responsible for the naturally produced low-fat milk, Snell said. The company expects the first commercial herd of cows supplying natural low-fat milk and spreadable butter for the market by 2011.